Ahhh, the power of blogging. 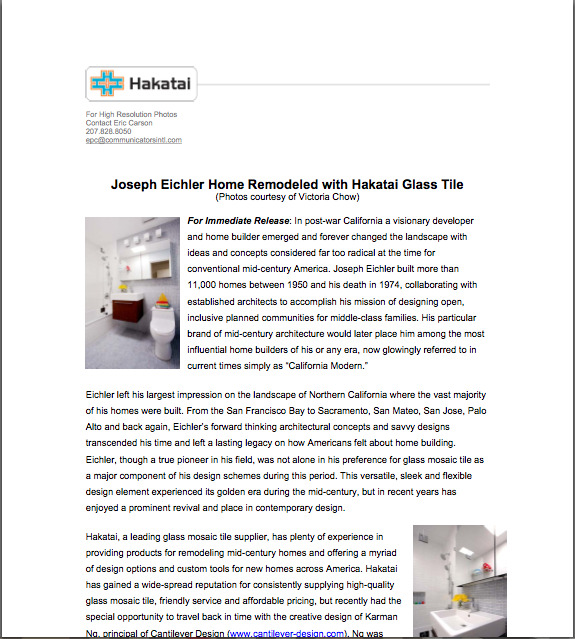 A couple days after blogging about the first of my two Eichler bathrooms, I got a surprise email from a representative from Hakatai Tile, the manufacturer of the glass mosaic tile that I used. Apparently every month they highlight a new designer and project who showcases their product, and they wanted to highlight me in March! What a nice surprise an honor. Today, Hakatai issued their press release about my project. 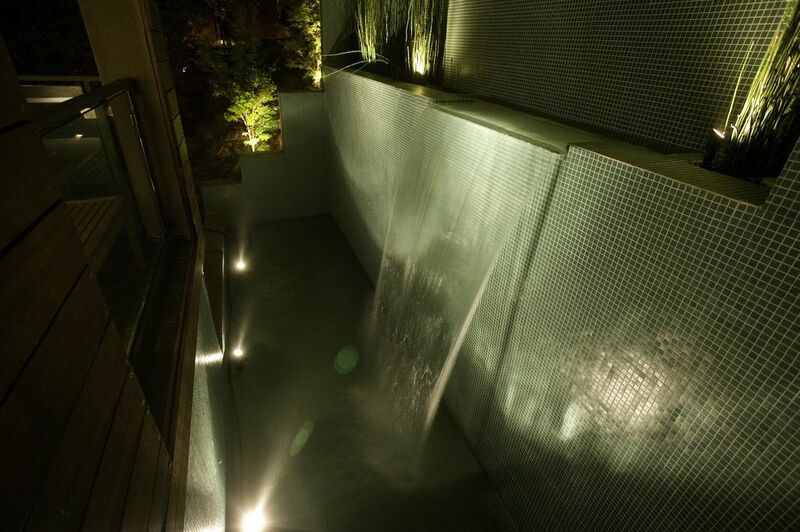 Since discovering and using Hakatai on my own house three years ago, on my outdoor water feature pictured above, I have remained a big fan of this company. Its product line is extensive, its quality is good, and most importantly, it’s very affordable. While it doesn’t have the cache of a Bisazza, Sichis or Oceanside Glass (nor the markup for that matter), it provides the same look or a similar look (depending on the line) for much less. Depending on the project, budget and client, Hakatai could be the perfect tile for your next project – check them out here. This particular press release is also an interesting read as it provides some history about Eichlers in addition to talking about our project and the product. I even learned something about just how green Hakatai’s Ashland-e series is, which is very sustainable by the way and would make a great option on your next green project. To read the complete press release, download it here: pr-2010-3-cantilever. This entry was posted in Uncategorized and tagged Ashland-e series, Bisazza, Hakatai, Joseph Eichler, Oceanside Glass, Sichis. Bookmark the permalink.